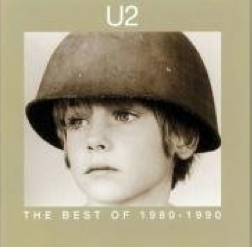 See now, I didn’t even know I had this when I wrote about U2’s previous “best of” . These are the songs I remember. I remember Ian Vickery saying to me that U2 were the best thing to come out of Ireland and that failure to like U2 meant unworthiness. Then some years later the same boy said that U2 were old hat and that the Waterboys were where it was at. I seem to recall someone else telling me that to like U2 meant you supported the IRA. Personally, I just thought they were rubbish. Possibly because they were as prog as Spandau Ballet. Things were messed up in the 80s. This compilation has all the popular songs used as background music in gritty dramas about “the troubles” or films where there would be lots of Irish youth being all gritty and hard done to. They just make me think of dark nights travelling down Hillfoot Avenue in the back of my dad’s Ford Orion. At some point between 1990 and 1995 someone once suggested to me that I should like U2. Fact is, I couldn’t stand them. Bono is a knob, this is a universal constant, but Adam Clayton sounds like someone who should be an estate agent and anyone that calls themselves “The Edge” is obviously trying to emulate someone calling themselves “The Cool” or “The Hipster”. With the same effect. For some reason this compilation is in my collection. I can’t stand U2. There are one or two songs I tolerate but they’re not on this compilation. They’re nothing special. People used to say how U2 were the sound of Northern Ireland and how they spoke about the troubles through their music. Perhaps they did. Perhaps having grown up during that time, the songs I tolerate still resonate with me. But, please, someone needs to stick a sock in Bono’s mouth. And a pillow case over his head. In my mind, the gritty Northern Ireland sound was produced to a better standard by Mike Scott and his Waterboys. Unfortunately, while the Waterboys later went down the Folky God Bothering Environmentalist Rout, U2 went down the “We’re the best so get used to it” Self Opinionated Bollocksfest Route.